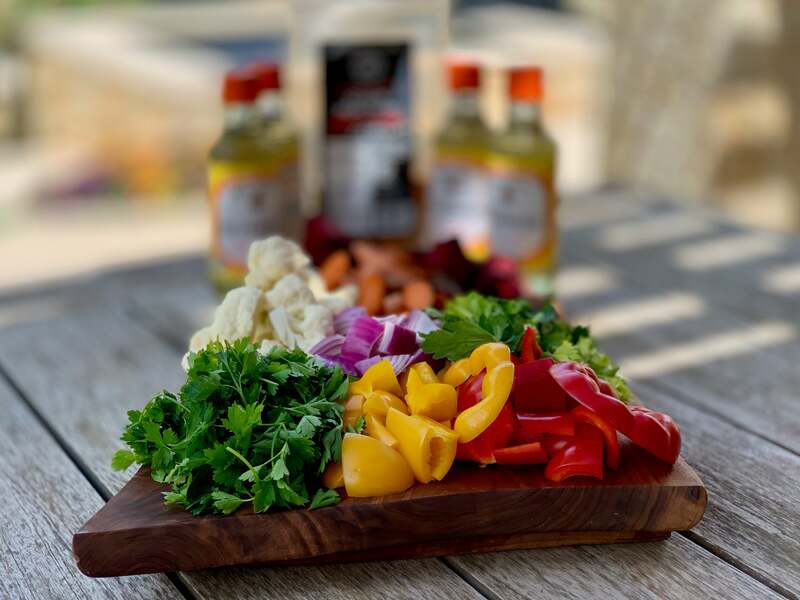 We are thrilled to offer you a Signature Recipe from our friend Chef Rob Olvera! When we tasted it the first time, we loved it, but the visuals on this one are simply incredible and the instant we posted a photo to social, it got engagement asking what it was and how to make it. Clearly a great sign... mostly because, as you can imagine, on a fairly regular basis Manny and I both get "beat up" by the vegetarian and vegan crowd asking for some vegetarian-friendly recipes. Being consummate carnivores (though fully appreciating our vegetables...) we tend to post heavily toward grilled meats. This recipe is super exciting because it is the perfect accompaniment to virtually everything and can even be used as a salad topping. Traditionally this dish is an Italian relish of pickled vegetables that can be in either oil or vinegar that is served as an antipasto or with salads. Spicing it up a bit, the Chicago-style version added serrano chiles and is often called "hot mix" in foodservice. 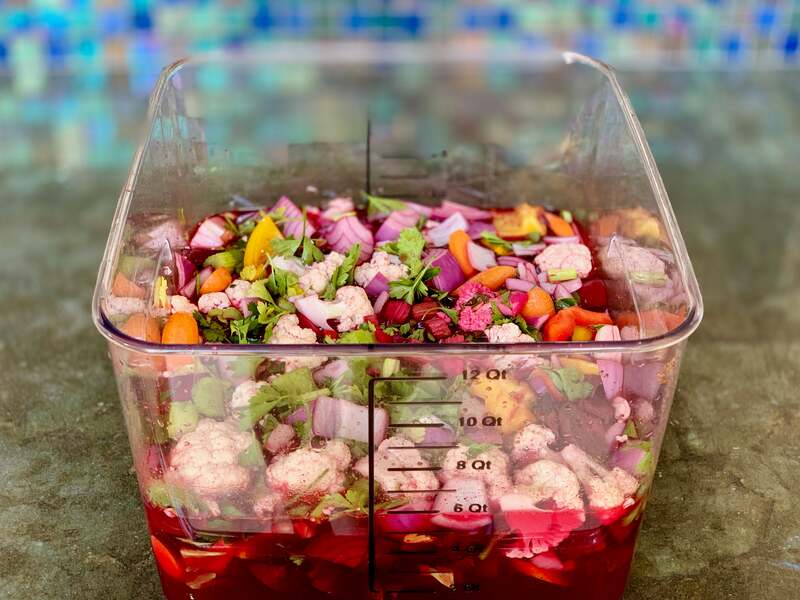 In general, as with most recipes, there are few hard and fast rules on making this dish other than making sure you have ample liquid to cover the vegetables. This one calls for basic "standard" ingredients like carrots, celery, bell pepper, and cauliflower, but also adds onion, beets, and some parsley. Generally speaking find what looks good and is in season at your local farmer's market or produce department and throw some of this together. You'll definitely be glad you did and it will become a staple in your rotation of healthy vegetarian-friedly dishes on offer. Chef Rob says he goes through a five-gallon tub of this every week in the cafe and that the clients always rave about it. "Pro Tip," Take one cup of the vegetable giardiniera, one cup of Mediterranean olives, and one cup of Blue Plate mayo and make the best spread ever for a traditional muffuletta! 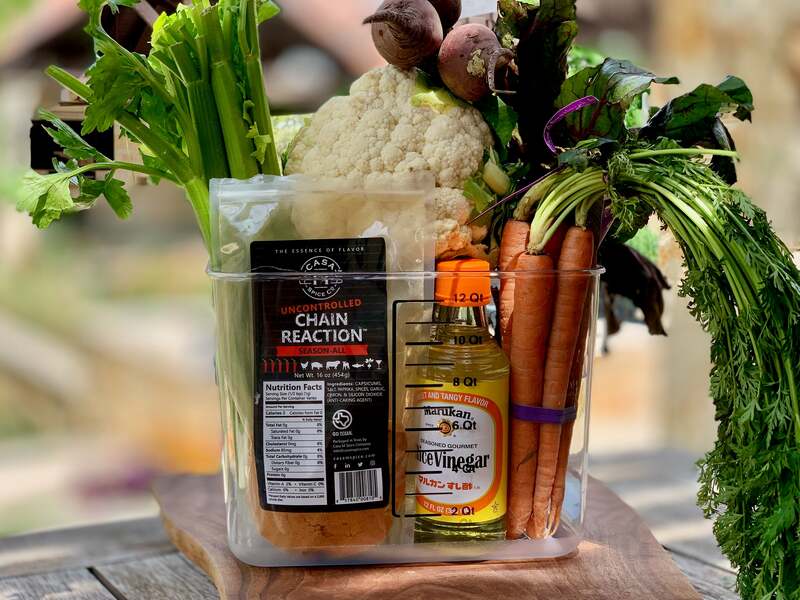 Add vinegar to the large bin and mix in Casa M Spice Co® Uncontrolled Chain Reaction®. Add all vegetables to the bin. Cover the bin (if not with a lid, with plastic food film) and place in the refrigerator. It's important to keep the vegetables submerged and mixed. Stir them daily to rotate them and ensure those on the top get down below the surface to have a chance to pickle. Let the vegetables sit in the bin (stirring DAILY) for at least two days. Note well that the vegetables get better over time. Always stir the mix before you serve. Use as a traditional antipasto, on salads, as a side, or even as a base for other creations. Pro tip: Take one cup of the vegetable giardiniera, one cup of Mediterranean olives and one cup of Blue Plate mayo and make the best spread ever for a traditional muffuletta!